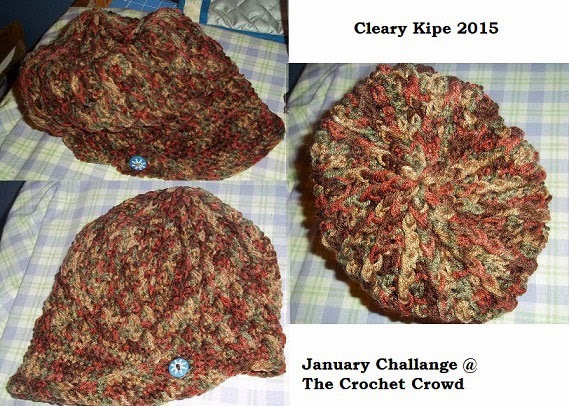 Got my Hat finished for the January Crochet Challenge yesterday. I like the way it came out was fun to learn new ways to stitch. I'm also working on the AAN 2015 SAL this year started it on the 5th and will be working on it more soon. Here are my fabrics for the up coming Superbowl mystery from Quiltbug.com on Feb. 2,2015 I just love these foxes and didn't get to do the other project I got them for so will use them in this. I'm also working on AAN Unicorn today I hope to get it finished soon. I'm still working on the New Year's Day mystery and will post more about that later. It has been really cold here the last 2 days so staying snuggled up. Hope everyone stays warm and safe.